I love to create cards, layouts and other unique items with my Black Cat Cougar and Make-the-Cut software! My friend Debbie and her niece came over today to talk about wedding flowers and such. We are going to make some 3D flowers to hang on the pews and I don't know what else. So we were playing around and I cut out this huge butterfly and a 3D flower (both files from SVG Cuts ). We were not intending for the flower to be on the butterfly but when they put them together we thought it looked pretty cool. The picture is not the greatest as I can only get pictures from my cell phone onto my computer now (having a conflict and my computer won't let my printer function any more!). Thanks so much for stopping by my blog. Leave a comment if you like, I appreciate it so very much. I had to enable to word verification due to spamming that recently started, sorry about that! Best wishes for a fabulous day! 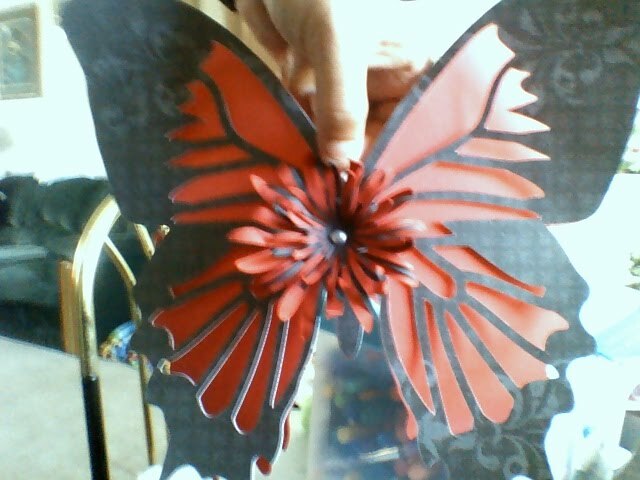 I began paper crafting a few years ago and I love the freedom the Make-the-Cut software gives me. No cartridges required, just some imagination, creativity and files from others (free and purchased). I hope you enjoy what you see here. Have a blessed day!